For some time now in the music community, attaching the prefix “post-“ to a genre has been a convenient way for artists to declare their musical roots and leanings, and then diverge from them in any number of ways, depending on the given artist. In the metal community, specifically, “progressive” seems to be the current name of the game for quite a number of bands, who are attempting to stretch the limits of what metal music can be and sound like. Sometimes this is to great, redefining ends, and sometimes it is disastrous. As for “experimental post-metal” groups such as Pelican and Russian Circles, the results have been monumentally positive. Canadian Newcomers Near Grey may very well be the next great group to join this list. In 2012, their debut, self-titled EP was met with praise from critics, now they have returned with their first full-length LP, and what a grand return it is. Boasting better production and an all around larger, more expansive sound, this foursome is clearly aiming to leave a mark on the post-doom/sludge metal scene. 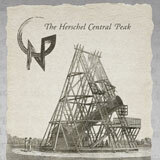 Clocking in just shy of forty minutes, ‘The Herschel Central Peak‘ feels like a journey through a strange, foreboding wilderness, wrought with bittersweet sentiments and long, contemplative stretches. Album opener ‘Sauropod‘ begins with a classical sounding doom riff, and is quickly joined by Marc-Olvier Germain (drums) and Nicolas Tremblay’s (bass) plodding rhythm section. The standout here is the almost church organ-like synth line that rings through the start of the track, ushering in Mitchel Rochefort’s lead guitar, which swiftly takes over with a soft, melancholy sound before bursting into a tremelo-picked tale of something between regret, sadness, and uncertainty. ‘Northfield‘ is and epic dreamscape, tentative in each step it makes, and almost positive, triumphant in nature. Reverb drenched guitars bounce off of one another, while Germain’s drums encourage each forward step deeper into the sonic abyss. Around the halfway point the guitars break into an almost hopeful chant, before giving way to a blast-beat fueled, frenzied descent into black-metal territory. The most sludgy, heavy sounding riff comes charging forth at the start of ‘Cannulated’, pummeling the ears with aggression and mass before quickly giving way to more of the multi-layered, earnest, yearning synth and guitar lines that seem to be Near Grey’s most prominent trademarks. The album closes with ‘Regina‘, the last in a line of four, ten-minute tracks, and it truly feels like the final act, the end of a journey. The feel here is the most foreboding and dangerous yet, with a great deal of the aforementioned bittersweet ambience giving way to an urgent sense of dread. As the song, and album, nears its end, the swelling of the guitars and drums together presents a clear sense of victory, as if something great has been achieved, albeit not without some losses. Are Near Grey pioneers of anything? No. The territory covered here is something that we’ve heard before, albeit with an interesting new perspective. Their take on a more melancholy Explosions In The Sky-esque doom/sludge album is not bad, it just isn’t particularly interesting. At times during my listens to the album I felt as if I was listening to one long song. While that worked in some cases (Sleep comes to mind), here it just feels as if a lot of the same ideas are being touched on again and again. Peak, valley, peak, valley, repeat. There doesn’t seem to be anything really setting each track apart from the rest, and as a result, this band from its predecessors in any memorable ways. This is a solid effort, make no mistake, it just doesn’t break any new ground, and I can’t imagine it being something I or many other listeners will rave about to fellow enthusiasts of the genre. As a definitive improvement over their first release, one only hopes that in the future Near Grey will take their impressive compositional skills to new heights and blow us away with something more fresh. Until then we have a quality release, good not great.